This past week I had the pleasure of testing out a new 2014 Chevy Volt four-door sedan. The Volt came in White Diamond Tricoat – a pearlescent white paint job, which is a very popular color for this model vehicle. The Volt is a version of the Chevrolet Cruze, but dressier with fancier mirrors, extra trim, and a substantial tail fin on the rear. And of the course the ground-breaking hybrid drive train. 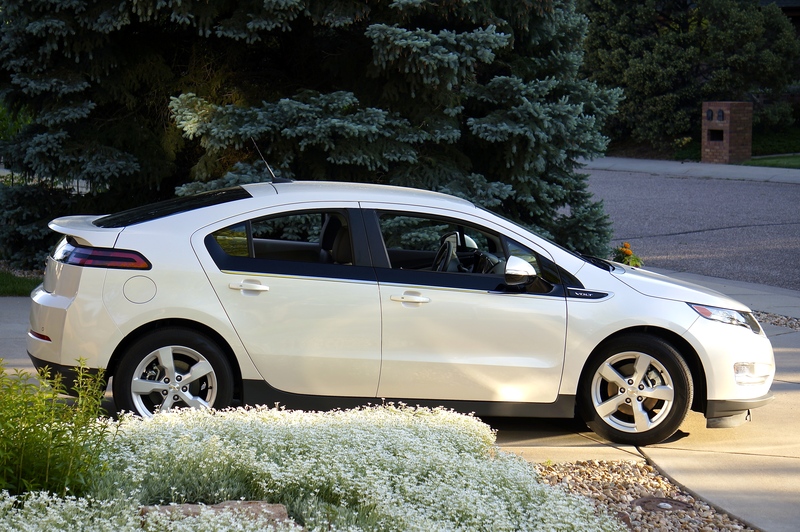 The Volt I had possession of had a base price of $34,185.00, with premium interior trim ($1,395), rear camera/park assist ($575), navigation system ($895.00), frontal vision camera ($595.00), Bose premium speakers ($495), and the upgraded paint ($995). With freight and a cargo net, that brought the M.S.R.P. to $39,945.00. Such a price screams “pride” on the part of General Motors , but reportedly a federal tax credit of $7,500, along with a Colorado state tax credit of $6,000, serves to knock off a third of that sticker price. Now that we have the purchase price back down to earth, let’s talk about driving the car. I took off for Denver to visit relatives last week, and the trip down there was 52 miles each way. Leaving town with a charged battery and full fuel tank, the computer said I obtained 46.5 miles per gallon, but my calculations came out better. The car ran on electricity alone for about 38 miles, and then imperceptibly moved to gasoline engine power. Actually, it was gas power generating electricity to power the front wheels. It was impressive. Coming back to Greeley, I bucked a wind and didn’t do as well on gas, 45.2 miles per gallon. That premium trim package on the car included black and white leather seating (seats four), leather trimmed steering wheel, and heated buckets up front. I didn’t suffer discomfort driving the Volt; the ride is sumptuous. The car weighs about 3,800 lbs. with its big battery, and that gives it a luxury ride. Handling is great, as well. All the electronics were on board – backup camera, nav, Bluetooth, 30g audio storage, DVD rom, pushbutton/remote start, and Sirius XM radio. The dual 7” screens on the dash are dazzling, and the sound system is superb. To charge up the car, you use an extension cord that is about 20 ft. long and plug it into a 120v outlet for ten hours. The gas engine is a 1.4 liter, 83 horsepower four, and the Voltec electric motor provides 149 horsepower and 173 lb. ft. of motoring torque. The alloy wheels are 17”, and are shod with 215/55R17 Goodyear Assurance Fuel Max tires. The warranty for the lithium-ion, 16 kWh, rechargeable battery is 100,000 miles or eight years. My first car was a 1957 Chevy four-door BelAir, and I thought it was terrific in all respects. Back then I couldn’t have imagined a vehicle such as the Volt (or me at the wheel.) I must admit I would have thought it was a pretty neat deal.